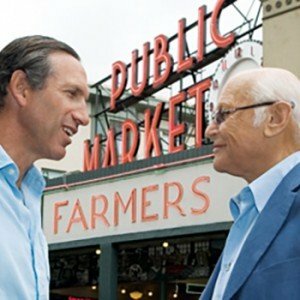 Norman Lear and Howard Schultz will be featured on ICONOCLASTS, Sundance Channels’ acclaimed television series that pairs visionaries from different fields to explore their passions and inspirations. An iconoclast is one who goes against the grain and dramatically affects his or her profession. Participants of ICONOCLASTS are given the opportunity to explore the life of someone they truly admire and share perspectives on their lives and careers. Each episode of ICONOCLASTS reveals an in-depth exchange between two iconoclasts who bring a mutual appreciation of each other’s craft to the relationship. ICONOCLASTS is directed by Joe Berlinger and Bruce Sinofsky, award-winning filmmakers who are known for such works as Brother’s Keeper, Paradise Lost, and Metallica: Some Kind Of Monster.